It's no secret being a first time parent isn't always easy. From getting pregnant to the nine months of pregnancy, there can be a lot of hurdles on the way. But thankfully there are many people and products out there that can help make things a little less hectic. One of those products that can help with making things go a little smoother is EZ-On BaBeez. EZ-On BaBeez is a revolutionary baby bodysuit that will have you singing it's praises in no time. It eliminates those frustrating snaps that you can't ever seem to get lined up (or find in the dark) with scratch-free Velcro. With its front flap design opening and closing the flap is super quick and easy. And it's even has a comfort liner to help resist leakage. Now that's what I call the perfect onesie. They even offer pants and hats so you can make the entire outfit coordinate. I like that they have cute imprints on them so they aren't just plain. Some have patterns and some have cute sayings, and the even have holiday ones too! EZ-On BaBeez is an innovatively redesigned bodysuit for babies, that provides fast and easy access during diaper changes. The soft, scratch-free Velcro closures at the front waist opening replace traditional snaps. Traditional snaps can be frustrating to open and downright difficult to close. Solution solved, no more snaps with EZ-On BaBeez. 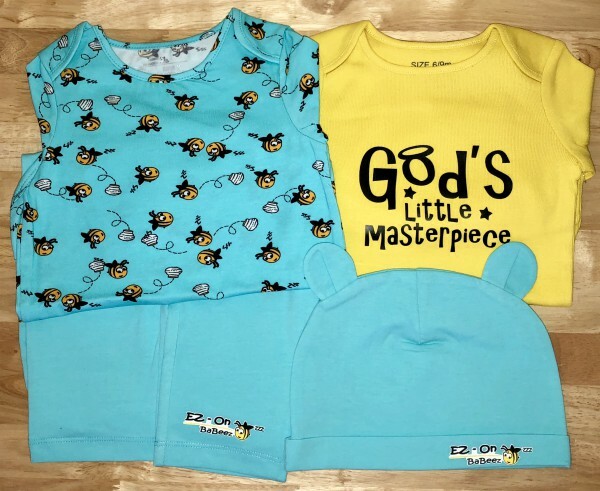 EZ-On Babeez onesies are available in six traditional sizes: 0-3 months, 3-6 months, 6-9 months, 9-12 months, and 12-18 months. “Onesies” are made of high quality, soft cotton and cotton/spandex blends for the utmost comfort. We have some to our friends for their new baby and they LOVED the ease of the change! I just gave one to my neighbor who has a 3 month old! I just can’t wait to see him in it! It makes such an awesome gift ! I ordered these as a gift for a friends grandchild, they are so soft and cute, and the velcro is super soft as well. I love them. I wish they were around when I had little ones! The grandbabies will definitely be using Easy on Babies products! These are seriously the best onesies on the market! I gave some to my cousins babies and they LOVE them! I gave this to a friend with a 6 month old baby and she loved it. It was so much easier ti changw the babys diaper. Cute colors and animals. Best onesie ever! Such a wonderful infant apparel! Every parent needs these outfits! Gave these to a non-profit that works with young mothers and they loved them. Said it will make their life so much better! Gave as gifts to two baby showers. Mother's to be loved them and dad to be was astatic!! !